A new study by Scotland’s Care Inspectorate has shown that up to 90% of elderly care home residents suffer from dementia. However, the research also revealed that, out of 1,284 homes surveyed, 908 said they provided general care for older people, whilst only 106 described themselves as specialists in dementia care; this means that just one in 10 care homes which responded actually provide specialist care for people living with dementia. This study, which was conducted throughout Scotland, noted that the trend is likely to be similar across other areas of the UK. There are specialist dementia care homes in every region of the country, but the majority of homes only cater for elderly people in a general sense or do not have staff who are fully qualified to care for residents who have dementia specifically. Another recent survey revealed that care home residents with dementia were under-diagnosed in up to 32 percent of cases; as many as 90 percent of residents either had a dementia diagnosis or were showing signs of early dementia. Professor June Andrews, director of the Dementia Services Development Centre at the University of Stirling, said that there was no reason that the findings from Scotland’s Care Inspectorate would not be the same across the UK. 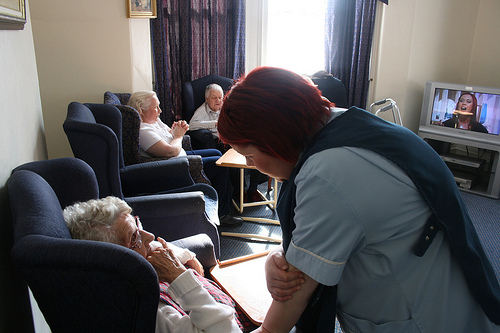 Experts have revealed as a result of the recent studies that, in general, the ratio of staff to residents needs to be 30% to 40% higher in UK care homes which specialise in dementia. These experts also feel, however, that this may not be possible in all care homes, as some councils are not prepared to provide the additional money required.